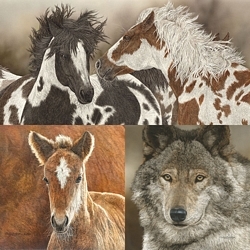 Image Size: 22"w x 30"h.
Today, America’s wild horses exist only at the pleasure of the government and through the dedication of those groups and volunteers who fight diligently for the right of those wild horses to survive. Long gone are the special grasses and plentiful water and endless, open lands that sustained wildlife and wild horses for many centuries. In the last 50 years, wild horses’ access to public lands have been cut by 40% due to special interests. Predation, drought, overgrazed lands, drilling, mining, and bait gathers, which separate established bands, mares and their foals, have all contributed to a crisis for healthy wild horse populations. Now, the government is considering culling wild horses for the first time in 50 years, putting the lives of thousands of horses at stake. And, the Bureau of Land Management has asked Congress for permission to kill the 45,000 wild horses relegated to holding pens. While that petition has failed for now, the question of how to control and correctly manage wild horse groups is a perplexing and troubling one. Some advocate for spaying all the wild mares, which would effectively end bloodlines established over hundreds of years, as well as eventually eliminate all wild horse herds. There are those dedicated groups of volunteers who have sought to work with their state and with the BLM in their area to protect their wild horses. Even those protected wild horses experience bait gathers on a regular basis. Without the concerted efforts of the American public, who overwhelmingly support the wild horse cause, our living legends will vanish. Wolves were rescued from the brink of extinction in the 1970s. But in 2011, the government began stripping their protection under the Endangered Species Act and transferring wolf management to the states. One state even reclassified wolves as varmints. By March of 2018, over 5000 wolves had been slaughtered in just seven states. Presently, our government is considering a proposal to strip the now-threatened Endangered Species Act protection from nearly all wolves in the lower 48 states, including for the extremely rare red wolf of North Carolina. Reintroduction of Mexican gray wolves has also faltered because of lukewarm state and uncertain federal government support. Loss of protection will mean that wolves will be vulnerable again to trophy hunting and trapping and mass annihilation. Will they vanish again?